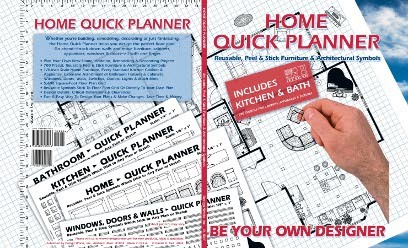 Home Quick Planner/5000 (Deluxe) with over 1000 furniture and architectural symbols! Includes 1,000 furniture and architectural symbols for every room in the house including living room, dining room, kitchen, den and bedroom furniture (2 sets), every standard kitchen cabinet and appliance, an extensive assortment of bathroom fixtures, windows, doors, walls, lights, outlets and switches plus two 5,600 square-foot Floor Plan Grid. There are enough symbols to plan a home up to about 5,000 square-feet. Same features as the regular peel and stick home planner plus more! Each Quick Planner includes hundreds of precut, 1/4-inch scale, reusable peel and stick furniture and architectural symbols, plus a Floor Plan Grid and design worksheet. Use the symbols to design your own project and make changes without having to draw and redraw your layout. Quick Planner symbols are printed on a clear plastic drafting film with a reusable adhesive which sticks to the 5,600 square-foot Floor Plan Grid included or to your own sketch or blueprint. Includes 1000 furniture and architectural symbols for every room in the house including living room, dining room, kitchen, den and bedroom furniture, every standard kitchen cabinet and appliance, an extensive assortment of bathroom fixtures, windows, doors, walls, lights, outlets and switches plus 5,600 square-foot Floor Plan Grid. There are enough symbols to plan a home up to about 5,000 square feet!